Enjoy these taco stand style potato and chorizo tacos topped with salsa verde. They are salty, greasy and spicy, and that is a good thing, a very good thing. Big flavor! Yum! This is typical street food. In Mexico, food that is quick, tasty and served in bite-size portions is known as antojitos which means “little cravings” and you will crave them after trying them, garantizado. 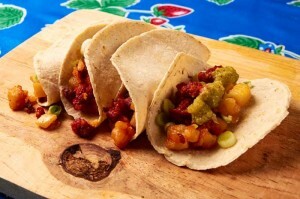 Wondering how to make chorizo tacos? We’ll show you. Gather all of your ingredients first. The recipe requires waxy potatoes. Russet potatoes won’t work because they will fall apart during cooking. Chorizo is the star of these tacos. Try different brands until you find your favorite. Each brand has a distinct flavor. Before using the chorizo you have to remove the outer membrane. 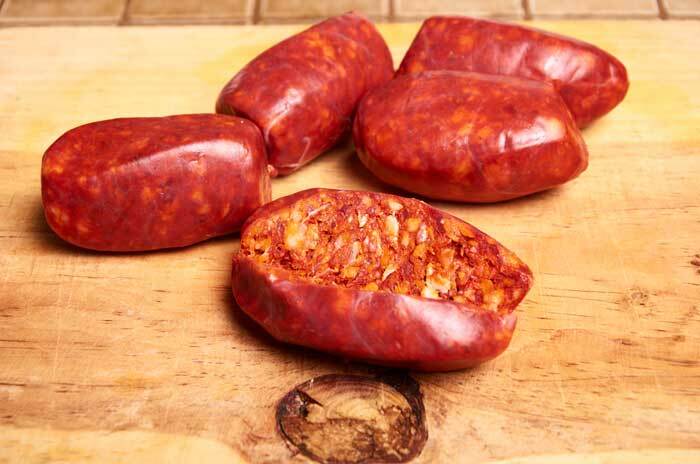 Split each chorizo open and then use your fingers to remove the membrane. Some chorizo pops out of the membrane really easily others take some effort to get out. Use your fingers to remove the membrane from the chorizo. Peel the potatoes. If you prefer you can leave the skins on for a more rustic filling. 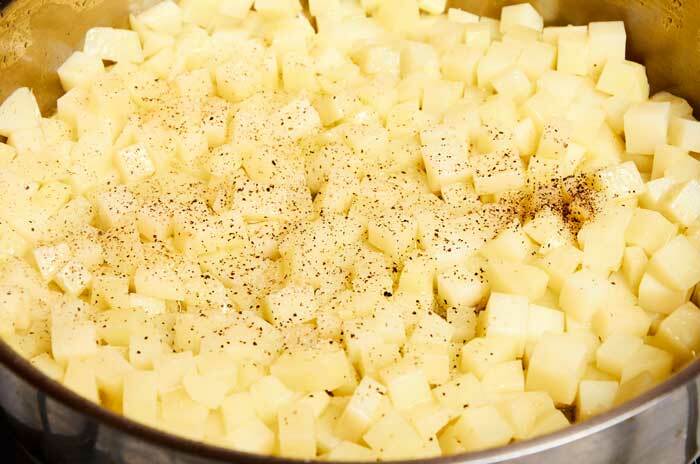 Cut the potatoes into 1/4″ squares. 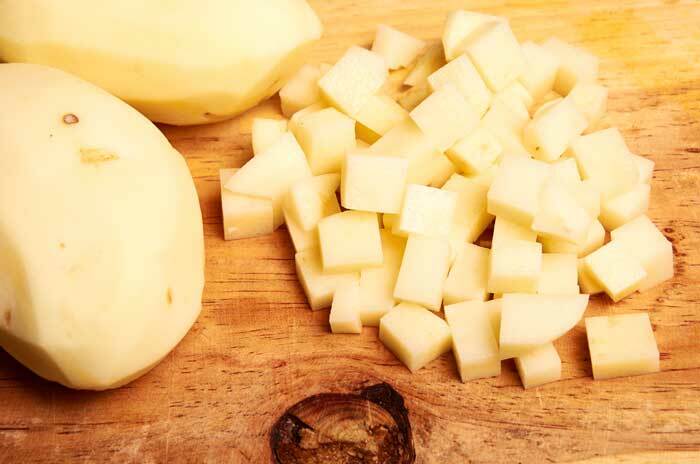 Cut the potato into 1/4″ squares. 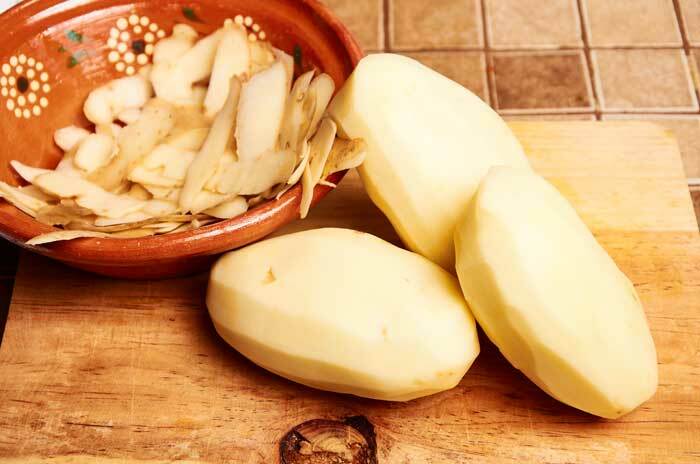 Soak the potatoes in water for a few minutes after cutting. 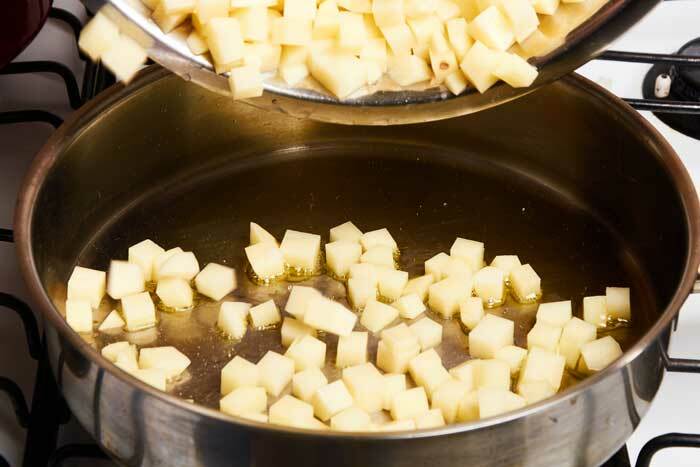 Soaking them keeps them from turning brown while you are preparing the other ingredients and removes some of the starch from the potatoes which helps them cook without sticking. Chop the onions. 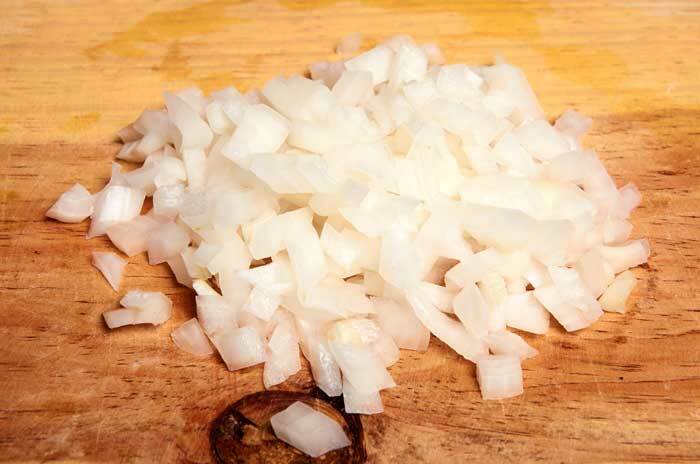 The onion should be cut into pieces about half the size of the potato pieces. 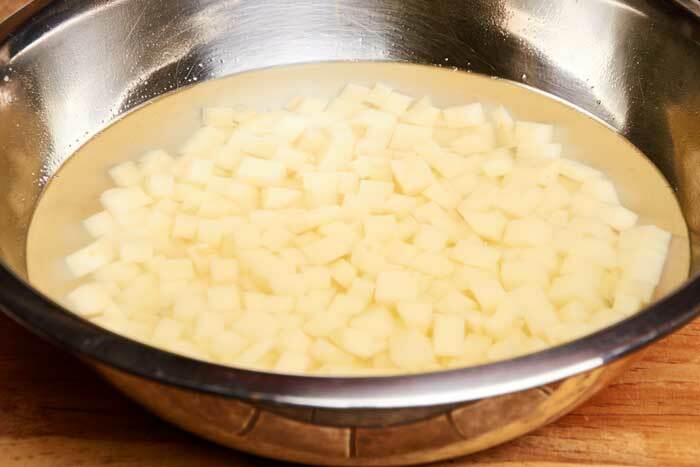 Start by adding the potatoes to 4 tablespoons of cooking oil pre-heated to medium hot. 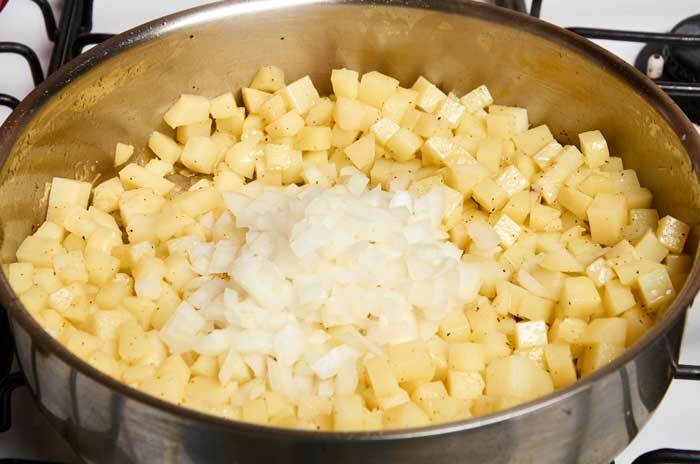 Stir the potatoes to coat evenly with the oil. The oil helps all of the great flavor from the chorizo stick. When you have coated the potatoes in oil season with the salt and pepper then cook for 3 minutes over medium-hot heat. Add the onion and stir to incorporate. Add the onions after frying the potatoes for 3 minutes. 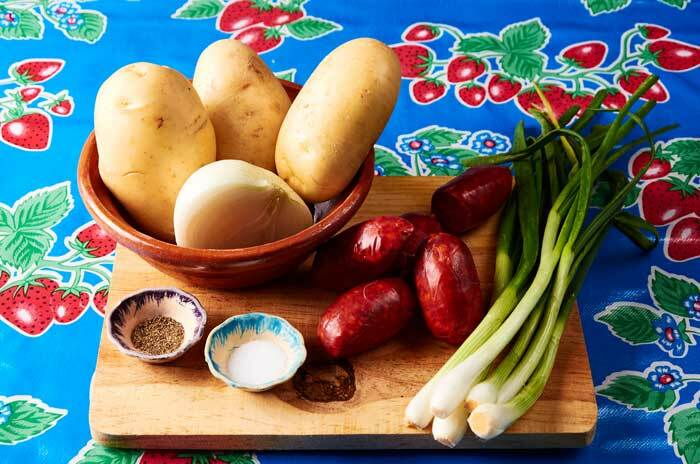 Fry the onions and potatoes for an additional 5 minutes then add the chorizo. Stir to incorporate. 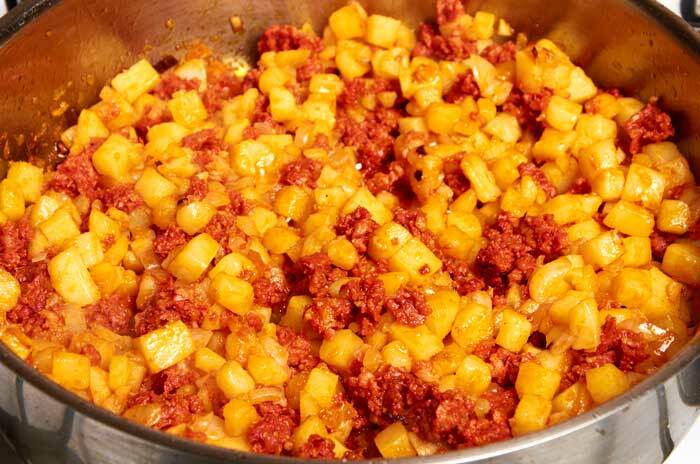 After frying the onions and potatoes for 5 minutes add the chorizo. Cook the mixture over medium heat for 10 minutes. After 10 minutes taste the potatoes to be sure they are fully cooked. If the aren’t, cook for another 2 to 3 minutes. 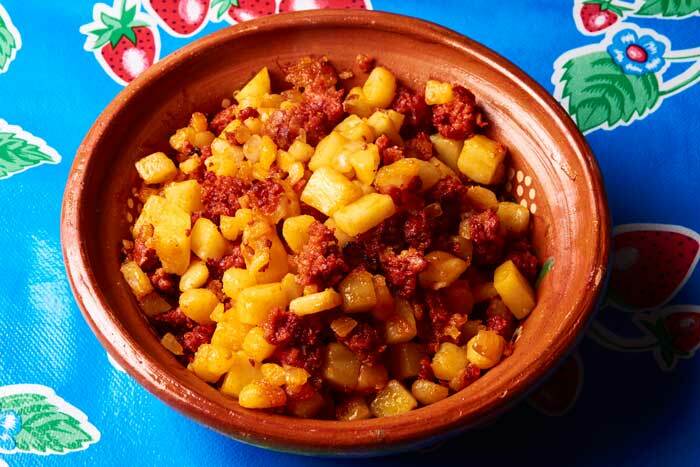 During cooking the chorizo will break up and disperse evenly throughout the filling. 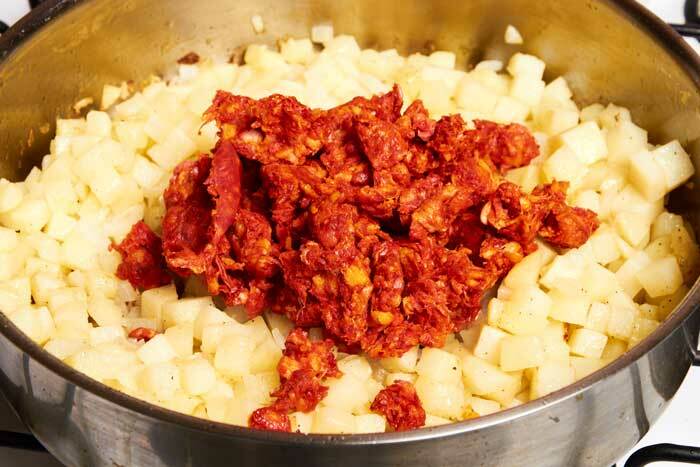 As the mixture cooks the chorizo renders its fat which flavors the potatoes. The filling is ready when the chorizo has fully rendered its fat and just starts to get crispy. Prepare these tacos with the small taqueria size corn tortillas. Put 1 generous tablespoon of filling on each tortilla. Don’t overstuff the tortilla with filling. You want to be able to taste each one of the ingredients in every bite. The balance of flavors is important. Serve the tacos topped with chopped spring onions or chopped white onions and our favorite green tomato salsa verde. You can also serve them with our creamy avocado salsa. An ice-cold Mexican beer, agua de jamaica, hibiscus iced tea, or agua de guayaba, a refreshing guava drink are all drinks that go well with these tacos. 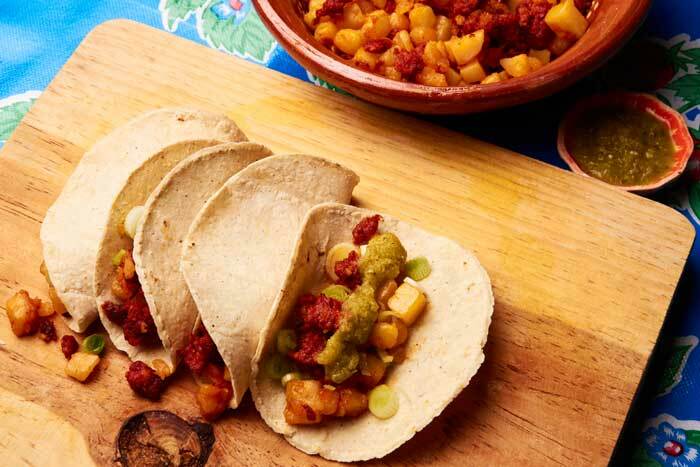 Easy chorizo and potato tacos topped with salsa verde just like at the taco stand. They are salty, greasy and spicy in the very best way. Big flavor! Yum! We like salsa verde with these tacos but any salsa you enjoy will work. If you don't have spring onions, you can use white onion to garnish the tacos. This turned out quite well. I and the kids liked it, husband not so much :) But he is not big on chorizo to begin with,. Thanks for a fun alternative for Taco Tuesdays!